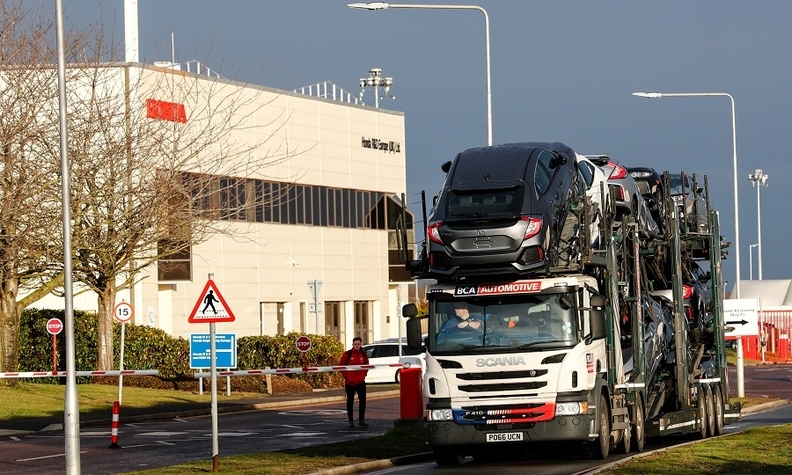 The closure of Honda’s Swindon plant was timed to the end of the end of the current Civic’s lifecycle, the automaker said. TOKYO – Honda Motor Co. will shutter assembly plants in England and Turkey by 2021 as the automaker pushes toward electrification and confronts changing trends in trade relations. The global restructuring move comes amid uncertainty about Britain’s so-called Brexit withdrawal from the European Union and the implementation of a new free trade pact between Europe and Japan. Honda CEO Takahiro Hachigo announced the move Tuesday at the company’s global headquarters in Tokyo. The production overhaul has nothing to do with Brexit and the decision was timed was planned to coincide with the end of the current Civic's lifecycle, Hachigo said. It is part of a wider adjustment of Honda’s global production base to improve efficiency and better tailor product to local markets, he said. "We have decided to carry out this production realignment in Europe in light of our efforts to optimize production allocation and production capacity globally as well as accelerating electrification," Hachigo said. "We have made this announcement today due to the timing for deciding on a production base for the next Civic. So, this decision has nothing to do with the Brexit." Honda has global production capacity for 5.4 million vehicles, but it sold only 5.24 million vehicles last year, giving it a utilization rate around 97 percent. After the changes, Honda’s global capacity will be trimmed to 5.1 million vehicles and the utilization rate will exceed 100 percent through overtime, Hachigo said. Honda's Europe boss, Ian Howells, said the automaker will focus its investments on China, the U.S. and Japan. "This is not a Brexit-related issue for us. This decision has been made on the basis of global changes," Howells told BBC Radio. The Swindon plant, opened in 1985, currently builds the Civic five-door hatchback for global markets including Europe and the U.S. The U.S. export model is the Civic Type R performance hatchback. It employs 3,500 people and produces about 150,000 vehicles a year. The factory has operated at less than full capacity in recent years as demand in Europe slumped, prompting Honda to suspend a production line with a capacity of 100,000 units in 2014. With the start of the next-generation Civic, other regions will pick up the output that came from Swindon, Honda said. This includes a bigger share for Honda's North American plants. About 55 percent of Swindon's output is exported to North America. "Given our efforts to optimize production allocation and production capacity on a global scale, we have concluded that we will produce the Civic for North America in North America," Hachigo said. Honda’s European headquarters will remain in the U.K., Honda said. Honda will also close its Turkish plant, which builds the Civic sedan and produces about 38,000 vehicles a year, but intends to continue sales and marketing operations in the country, Honda said. The U.K. has long been a Japanese hub for European auto production, with Honda, Nissan and Toyota owning three of the country’s six largest carmaking factories. That has quickly unraveled, with Nissan this month reneging on plans to build the X-Trail SUV in Sunderland -- partly due to the unresolved status of EU-U.K. trade after Brexit. U.K.-built products also risk being disadvantaged by a new treaty that will gradually eliminate tariffs on Japanese imports to the EU. The EU-Japan Economic Partnership Agreement, in force since Feb. 1, ensures that the bloc’s 10 percent tariff on Japanese car imports will be reduced to zero over the next 10 years. The treaty makes it easier for Japanese automakers to localize production at home for sale in the EU, consulting firm LMC Automotive said in a report this month. The U.K. is most at risk because almost half of the cars made in the country are Japanese branded, and Japanese automakers want to increase utilization of plants at home. "Should Britain leave without a deal and WTO tariffs are applied to U.K. vehicle exports, the same cars made in Japan may well end up costing less to import into the EU than those produced just over the Channel in England," LMC’s director of global production forecast, Justin Cox, said in the Feb. 11 report. Hachigo said the trade pact will improve the competitiveness of Japanese exports in the European market. The U.K. auto industry has already been battling Brexit-related slowdown, potential tariffs and supply bottlenecks ahead of the exit from the EU on March 29. U.K. lawmakers have yet to find a solution to avert a no-deal split from the EU. Ford Motor announced thousands of job cuts in Europe last week and said a hard Brexit would be “catastrophic” for the U.K. auto industry and its own engine-production facilities in the country. Jaguar Land Rover, Britain’s biggest automaker, said in January it would scrap 4,500 positions in response to a sales slowdown blamed on reasons including Brexit. PSA Group’s Vauxhall Ellesmere Port site is in doubt as it mulls plans for the next Astra. As the political impasse over Brexit drags on, investments in the British automotive industry nearly halved last year to 589 million pounds ($760 million), the lowest since the global financial crisis, according to the Society of Motor Manufacturers. Honda is revamping its global production footprint as it tries to tackle overcapacity at Japanese factories and the need to produce more electrified vehicles to meet more stringent emissions standards. Honda wants to get two-thirds of global sales from electrified vehicles by 2030. In October 2017, Honda said it would take the rare step of shuttering a Japanese assembly plant as it shifts manufacturing know-how toward electrified cars. It said the aging Sayama assembly plant would wind down by March 31, 2022 and consolidate operations around the nearby Yorii plant, one of the automaker’s newest. Yorii, which opened in 2013, will be positioned as a worldwide center for developing cutting-edge manufacturing technologies as well as techniques for producing electrified vehicles. As part of the changes, Honda said it will also appoint a chairman to the currently vacant position. Toshiaki Mikoshiba, who currently oversees global sales and marketing as well as North American operations, will take the chairman’s role.